In this photo provided by U.S. Forces Korea, trucks carrying U.S. missile launchers and other equipment needed to set up the Terminal High Altitude Area Defense (THAAD) missile defense system arrive at the Osan air base in Pyeongtaek, South Korea, March 6, 2017. The latest North Korean missile test Wednesday, launched near the country's submarine base in Sinpo, could indicate the military is developing counter measures to defend against the threat of a U.S. preemptive strike and to nullify the advantage of the THAAD missile defense system being deployed in the South. Both U.S. and South Korean militaries detected an early morning launch of a single ballistic missile at a land-based facility near Sinpo in South Hamgyong Province on the east coast of the country. Initial assessments indicate the type of missile was a KN-15 medium range ballistic missile. The North American Aerospace Defense Command (NORAD) determined the missile launch from North Korea did not pose a threat to North America. The South Korean military Joint Chiefs of Staff (JCS) said in a statement that North Korea fired a ballistic missile into its eastern waters and that the projectile flew about 60 kilometers (37 miles). Wednesday’s test represents a recent shift for the North Korean military from simple first-generation liquid fueled missiles to more advanced medium range ballistic missiles using solid fuel that is more difficult to detect prior to launch, said Jeffrey Lewis, the director of the East Asia Nonproliferation Program at the Middlebury Institute of International Studies in California. Solid fuel rockets can be stored in hidden, protective bunkers and quickly deployed before they can be detected by satellites, while liquid fueled missiles usually need to be filled prior to launch, which requires time and a number of support vehicles that can more easily be targeted by an enemy preemptive attack. 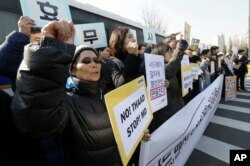 South Korean protesters stage a rally to oppose a plan to deploy an advanced U.S. missile defense system called Terminal High-Altitude Area Defense, or THAAD, in front of the Defense Ministry in Seoul, South Korea, Feb. 28, 2017. The location of Wednesday’s test is important because it demonstrates North Korea's expanding capacity to launch an attack from various undisclosed locations utilizing an estimated arsenal of 100 missile launchers, each armed with several missiles. North Korea's last four missile tests were fired from different sites. A February 12 test of a Polaris-2 missile was conducted in the northwest part of the country near the Banghyun Airbase in Northern Pyongan province. By demonstrating a capacity to launch a salvo of missiles from different sites, North Korea could neutralize the ability of the U.S. Terminal High Altitude Area Defense (THAAD) missile system. The THAAD single battery currently being deployed in South Korea, that uses powerful radar to target and intercept incoming missiles, could be overwhelmed by a massive North Korea missile attack. Also, the Sinpo location, near the military submarine base and firing a KN-15 missile that had been used in past ocean based launches, could indicate that the test was related to the development of a submarine launch based missile (SLBM) capability. In August, North Korea successfully fired a SLBM that flew about 500 kilometers (310 miles) towards Japan. However Admiral Scott Swift, the Commander of the U.S. Pacific Command, said recently that Pyongyang is still years away from developing a reliable SLBM threat. Developing a SLBM capability, however, would give North Korean forces the ability to position missiles outside of the THAAD radar field of vision that is forward looking toward the North. “What a submarine would allow the North Koreans to do is to sail out to where the THAAD radar cannot see, and then shoot at the THAAD radar basically from behind,” said Lewis. FILE - This combination of file photos shows U.S. President Donald Trump, March 28, 2017, in Washington (left), and Chinese President Xi Jinping, Feb. 22, 2017, in Beijing. 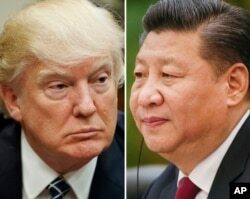 Wednesday's North Korean ballistic missile test was conducted just 48 hours before U.S. President Donald Trump is due to meet Chinese President Xi Jinping to discuss Pyongyang's nuclear ambitions. Any launch of objects using the ballistic missile technology is a violation of U.N. Security Council resolutions, but the North has defied the ban as an infringement of its sovereign rights to self-defense and pursuit of space exploration. Japanese Chief Cabinet Secretary Yoshihide Suga also offered a stern rebuke. “We absolutely cannot tolerate North Korea's repeated provocative acts and have strongly protested this act,” he said. Wednesday's launch came after Trump threatened that the United States is prepared to go it alone to counter the North's nuclear threat if China does not step in. North Korea's foreign ministry on Monday assailed Washington for its tough talk and for an ongoing joint military exercise with South Korea and Japan, which Pyongyang sees as a dress rehearsal for invasion. The “reckless actions” are driving the tense situation on the Korean peninsula “to the brink of a war,” a ministry spokesman was quoted as saying by the official KCNA news agency. South Korean intelligence warned in late March that North Korea could detonate a nuclear device in the first week of April to “overshadow” the U.S.-China summit.